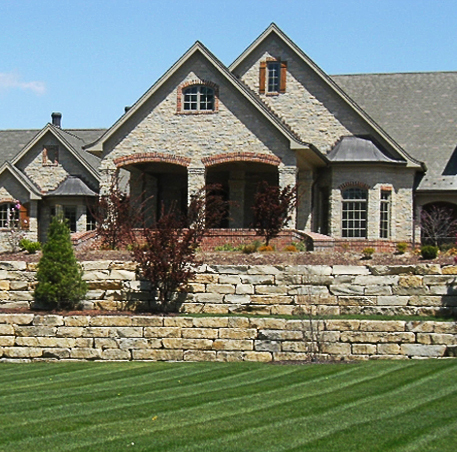 Retaining Wall Solutions Inc. is a full-service hardscape construction company. Our team is comprised of a group of highly skilled designers, engineers, retaining wall builders and pavers in St. Louis. We are equipped to manage residential and commercial jobs of all sizes from inception of the initial design to cleanup of the completed construction site. Every project is custom designed to address the specific site requirements and challenges, while also complementing any existing structures. We provide complimentary retaining wall and paver estimates to every new client to make sure that they are clear on the costs and specifications of their project. Our number-one priority is to complete each job on-time and within budget. Are you considering adding a retaining wall to your property? If so, there are numerous benefits provided by retaining walls. One of the main uses of a retaining wall is to improve the appearance of a yard or garden. In addition to improving the looks of any property, adding a retaining wall can provide additional advantages for the land itself. A retaining wall is a protective structure that provides additional support to keep the soil in place. This, in turn, prevents the formation of sinkholes, which are not only an eyesore, but also a tripping hazard as well. Retaining walls are also invaluable during heavy rains, since they keep certain areas from flooding. This added protection from running water helps to prevent soil erosion, and therefore reduces the amount of maintenance your garden or land needs on a regular basis. Depending on the placement of your retaining wall, it can also protect the surrounding structures, including any large or small buildings on your property. You like the way your garden looks, but it seems like something is missing. If you feel this way about your landscape, a retaining wall is an excellent way to protect your property and add curb appeal at the same time. We can construct a beautiful retaining wall customized to fit in seamlessly with the existing layout of your property, and bring a sense of cohesion throughout your landscape. When it comes to choosing a design for your retaining wall, there are numerous options. We build gorgeous walls made from modular blocks manufactured by the best brands in the industry, including Keystone®, Anchor®, and Rockwood®, among others. These blocks have the design flexibility to mimic the appearance of a variety of natural stones. You choose the exact color and texture you want your retaining wall to have, so it will act as the perfect complement to your property. When you hire our contractor to put up a retaining wall, you can be confident that we have all of the knowledge, resources and experience to do an outstanding job. With more than 15 years of on-the-job experience, our team knows how to construct retaining walls of every shape and size for both residential and commercial properties. We also have access to high-end materials, allowing us to build premium quality walls for our customers while keeping our prices low. Our goal is to make your property look the way you envisioned and surpass your expectations when the job is complete. Do you want to learn more about how the St. Louis retaining wall and paving contractor at Retaining Wall Solutions Inc. can transform your home or commercial property? Call our office now to speak to an engineering professional or book an appointment to get a free estimate. We are proud to serve numerous customers throughout the greater St. Louis metropolitan area, including those in Chesterfield,Wildwood, Webster Groves, Frontenac, Town & Country, Ballwin, Ellisville, Clarkson Valley, Creve Coeur, Kirkwood, St. Charles, Eureka, Des Peres, St. Peters and O'Fallon, Missouri.